Very real challenges for schools and music services persist, especially the central aim to provide and support EVERY child with a meaningful musical education. Government funding still fails to recognise the scale and reach of the task demanded and even successful proven traditional models of delivery cannot alone bridge all the gaps. We do not have a silver bullet, but we have a substantial and comprehensive offer for music education that has a proven record of success. If yes is the answer to the following 3 questions, then we have at least 5 ways in which we can help you boost your Music Hub. Want even more of your children and young people to have a chance to learn an instrument over a sustained period and play in an ensemble? Recognise both a need and a place for greater use of technology that harnesses your existing successful programmes of delivery and complements them with new affordable and scalable mechanisms that can help reach even the hardest to reach schools and their pupils? Want to continue to meet Ofsted’s ever more demanding priorities for improving music and access to sustainable, progressive, music learning? Gigajam is genuinely affordable and we can host the service for all your schools, colleges, educational establishments, and looked after children reaching the even hardest to reach. If you want Gigajam for your hub we can agree a cost you can afford. For an indication of just how affordable see our hub pricing. If you want Gigajam for your school see our school pricing. Please contact us now. 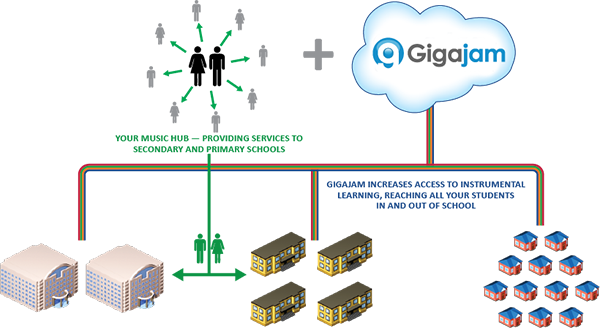 We would be delighted to have the opportunity to discuss your service’s needs and how Gigajam can help you. We look forward to hearing from you.